The format for December’s National Environmental Policy Act meeting focused on information and constructive dialogue. In a cavernous Portland Convention Center ballroom lined with federal officials who operate the Columbia River Basin dams, the most important person in the room may be a stenographer. 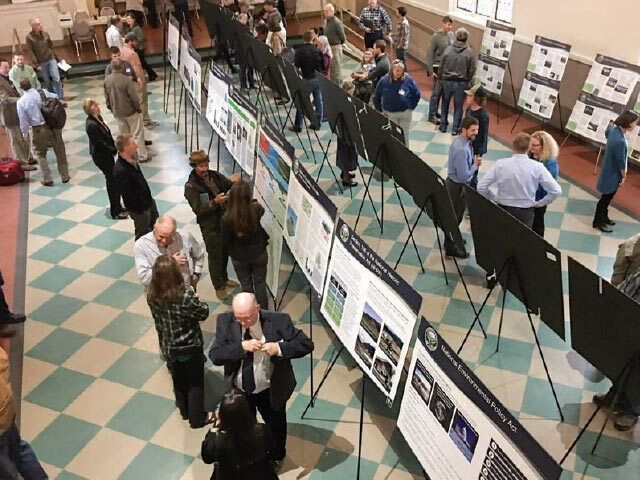 The December 7, 2016, meeting was one of 15 hosted by federal agencies throughout the region to solicit public input on the future of the 14 Columbia River Basin dams. Feedback from these meetings will be used to develop alternatives under the National Environmental Policy Act for operations of the hydro system, which will inform a new biological opinion to be submitted to the court. This so called five year “NEPA process” stemmed from a May 2016 ruling by U.S. District Court Judge Michael Simon, who claimed the federal government needed to “consider more aggressive changes” to mitigate the effect of the dams on fish, including analyzing removing or breaching the Snake River dams. For a supercharged debate that often generates more heat than light, the meeting’s format was structured to lower the temperature. Instead of town hall style meetings that favor the loudest voices, these sessions were more like graduate school seminars. Experts with the U.S. Army Corps of Engineers, Bureau of Reclamation and the Bonneville Power Administration positioned themselves at informative displays and answered questions on various aspects of the projects—from navigation, irrigation, flood control and electric generation to impacts on fish and wildlife. On the other side of the room, attendees offered their opinions on notecards or through a stenographer. This is where Northwest RiverPartners Executive Director Terry Flores could be found—one voice among many, but an influential voice to be sure. Northwest RiverPartners is an advocacy group that promotes the economic and environmental benefits of years, Flores—a former hydro relicensing expert—has been at the center of one of the most contentious environmental issues in the region. 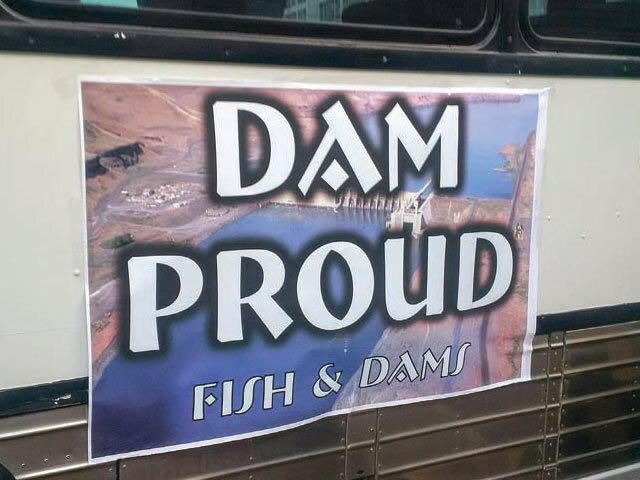 Wearing a button that read “Dam Proud,” Flores reeled off substantive arguments for dam preservation. She knows the process is a bit of a numbers game. During her tenure at Northwest RiverPartners, Flores has heard just about everything. She has heard claims that the dams completely block passage for fish, ignoring the fact they provide passage for adult fish moving upstream and young fish headed downstream, at very high survival rates. The sign on a Northwest RiverPartners bus tells the whole story at the NEPA meeting in Portland. She has heard there are no adverse consequences of either tearing out or spilling more water over the dams. “The NEPA process will help get the facts on the table,” Flores says. Northwest RiverPartners promotes a comprehensive approach to fish recovery—one that also looks at harvest levels, ocean conditions and hatcheries. “For the past 20 years, the focus has been on the hydro system,” Flores said, adding that billions of dollars have been invested to improve fish survival. Of particular concern has been the push by fish advocates to spill more water over the dams to flush young fish down the river. Flores said that tool must be used cautiously because it is costly to customers and can kill salmon by adding lethal amounts of dissolved gas to the river. While the meeting format was designed to foster constructive dialogue, there is still an inevitable effort to win the public relations war. Anti-dam organizations occupied the entrance of the convention center holding inflatable Orcas, though it is unclear what the popular mammals have to do with the current debate, other than their universal appeal. “There is no scientific connection linking Orca whale populations and Snake River dams,” Flores said, noting Simon came to the same conclusion. It is not lost on Flores that many of the same environmental groups supporting dam breaching also are concerned with climate change. Clean, renewable hydropower generates nearly 60 percent of the Northwest’s electricity, with almost two thirds of the output coming from federal dams on the Columbia and Snake rivers. Breaching the dams—which only Congress can approve—would, according to regional power planners, require three coal fired or six gas fired power plants to replace the output. At the very least, the public meetings provided basic facts to help inform the debate. “There is a ton of good information here,” said Dave Schneider, CEO of Midstate Electric, which serves its consumers in central Oregon with hydropower from the Columbia River system. A Bureau of Reclamation official who attended several meetings noted that some advocates favoring dam breaching were surprised to learn the dams generated electricity. For all the passion behind the issue, the public will have its say. “The comments will be important,” said Elliot Mainzer, the BPA administrator who attended the Portland meeting to get a feel of the interactions. Also attending the meeting was Scott Corwin, a veteran of the salmon debate and executive director of the Public Power Council, which works closely with Northwest RiverPartners. “It’s the first step in a long process, and public utilities need to be involved every step of the way,” Corwin said. The federal agencies have extended the comment deadline to February 7, 2017. That date is the start of a multiyear process of developing alternatives to be released by March 2020. “We need to remind people that the dams are the Northwest’s greatest renewable, reliable resource,” Flores said. No one needs a stenographer for that.